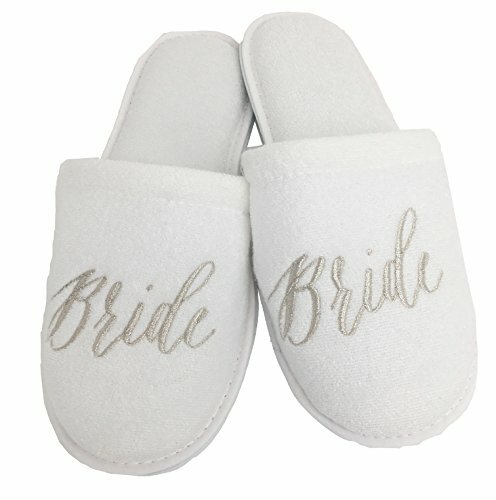 These slippers make a perfect gift for your mom, mother-in-law, maid of honor and bridesmaids and the bride and groom-to-be. Perfect for the photos of the morning of the wedding and/or popping the question to your bridesmaids. They would love it! The slippers are made of towel material. We used metallic thread for the design to make it extra chick and classy! The soles are made of durable rubber so you will be able to use them for a long while. I've been using mine daily for a year and a half and they still have plenty of life left in them. Perfect as an engagement gift! If you have any questions about this product by Personalized Slippers, contact us by completing and submitting the form below. If you are looking for a specif part number, please include it with your message.